You Are Here: Home » Our Farm Animals » A little Nigerian surprise for Thanksgiving! A little Nigerian surprise for Thanksgiving! Today was a busy day. I had to meet with a lady in Dayton about Boris and the Christmas parade and then I had to go shop for stuff to try to make him an appropriate outfit. No sooner had I arrived home that I had to meet a fellow at “the barn” to receive my winter/spring supply of hay. 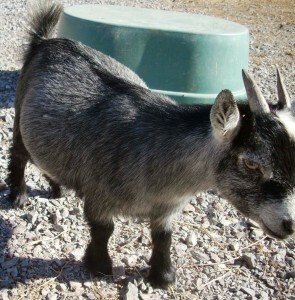 So I rushed down to organize that and I noticed that Sweety, a 9 month old Nigerian Dwarf goat was in labor! How could that be? That meant that she’d have been bred when she was only 4 months old! I bought Blacky with her twins Sweety & Butty back in June. Although the twins were only about 4 months old, Butty was put in the boys yard to avoid any accidents. Well, accident there was because 5 months lady, poor Sweety was knee deep in labor pains. I put her in a separate pen and spent the rest of the day with her. Just petting her and comforting her. I was really apprehensive because of Sweety’s young age. Does this young sometimes die during childbirth or the babies die. Other times the mom won’t acknowledge the baby because she’s just not ready. It’s really a bad idea to breed before a year old. I felt so bad for her. She was in such pain and for quite a bit of time. From around 2:30 until the arrival of Grace around 5:30 pm. Grace was not presenting herself well. Her head came first and her front legs were bent back. I cleaned her face and mouth and just watched as they both struggled to accomplish the task. After a few minutes I “went in” and was able to pull one leg out. That helped a little but one leg was still bent back. It was heart wrenching to see Sweety struggle with this but after a few minutes, one big push and Grace slid in my hands. Sweety was exhausted and just lay sleeping quietly while I rubbed Grace with straw and made sure she was alright. During this time my husband was video taping (will be posted later) and he also put up a heat lamp – it takes quite a bit of time for the kids to dry completely. Does are not as thorough as dogs in this department. It was at this time that all hell broke loose. The donkeys had been let out of their pasture so their shed could be cleaned but they took that opportunity to head down the driveway towards the road. One of our rescue puppies also chose that moment to mutilate one of my hens (which Scott rescued and brought back to the barn). Scott couldn’t get control of the donkeys or the dog & I had to catch one donkey (then the other follows), and lead her back home. Scott caught the dog a little later. My pastures are all messed up because late last week a huge tree fell and damaged the fencing. That area is no longer secure for the goats so I can only keep the little horses there. The fence repair guy was supposed to be her 2 days ago but he got sick and won’t be able to make it until next week. I have to keep Boris away from the pregnant goats because he just doesn’t give a hoot where he puts his feet and could easily squash either a goat in labor or one of my fainters. I do have to keep Boris where he is because that’s where his pen is that we had built especially for him. I can’t put the goats in the other pastures because they would be too exposed to the elements for birthing. It’s not the end of the world but things can get a little complicated! At the end of the day, Sweety is doing fine and Grace is an adorable, mostly white healthy little doe. I’m assuming that Grace is sucking well but I’ll know in the morning. I love baby goats. They are so freakin CUTE!!! A bit of sad news.. the mutilated hen died of her wounds. Anybody want a dog?